Settlement discount can be applied to sales orders to offer discount to customers who pay within agreed payment terms. Settlement discount in Brightpearl complies to the tax rules for the UK so that the sales invoice shows the undiscounted net amount, and a discounted tax amount. Only the tax is reduced in case they do not take advantage of the discount. When the payment is received the discount is written off when the payment is allocated. If the customer takes advantage of the discount in this case, the payment received will be £108 for a £118 invoice, meaning the £10 difference should be written to the discount nominal code at the point the payment is receipted in Brightpearl. Why is the total different? The thing to focus on is that a settlement discount is effectively a finance charge. What you are essentially saying to your customer (using the example above) is that if they pay within 10 days, then they can pay £90 plus VAT, so the total is £108. If they pay after that then they must also pay a £10 finance charge. Since finance charges are VAT exempt the VAT remains at £18 and total becomes £118. When you generate the invoice the total includes the finance charge; it is up to your customer to take advantage of the discount and pay the reduced amount. The customer does not take advantage of the discount and pays the full amount. You don't need to do anything different when receipting the full amount. The customer takes advantage of the discount and therefore the payment received is less then the invoice amount. Go to the customer account and select Allocate payment. 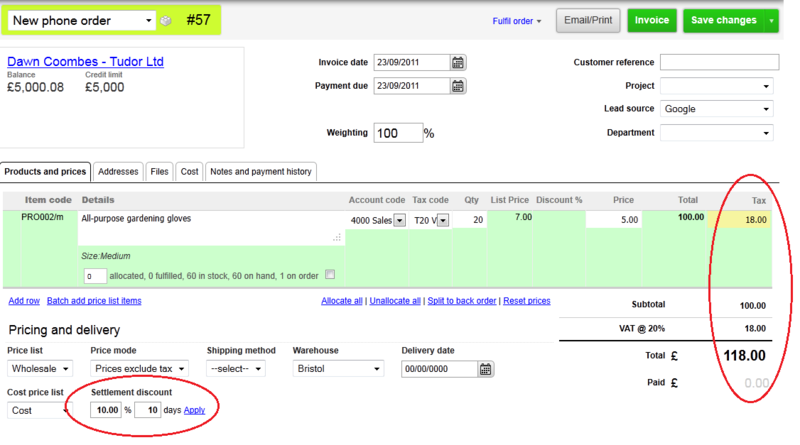 In the "To pay now" field for the invoice, type the discounted amount you wish to pay - the amount of money received. Enter the remaining amount (the discount) into the "Adjustment" field. Select the nominal code to allocate the adjustment to and select the nominal code to write the difference off to. Note: A nominal code must be set to Yes to "Allocate discounts to this account?" to show in this drop-down. Select the bank account the payment was received into. Enter the payment reference number. Click the Allocate payment button. That will completely clear the invoice from the account and display as settlement discount on the profit & loss. As from April 1st 2015, HMRC changed the way that VAT on settlement discounts (also called prompt payment discounts) needs to be dealt with. You can read more about these changes here . Following these changes, the current settlement discount function in Brightpearl still works successfully; providing you follow the rules set out by HMRC and pay prior to discount days. Our partners at Evenstone have written a blog which contains a couple of alternative solutions to help you to manage settlement discounts within Brightpearl.